The ACS Buy Here Pay Here software was designed to help you fulfill an important need in tracking payment accounts. The following information will help familiarize you with our software including how to work through setting up customers, collecting payments, and following up with customers. Read each section carefully and feel free to call our support staff with any questions you have. Once you are signed into the ACS Buy Here Pay Here program you will see several options available from the main screen. Starting at the top you see File, Reports, Maintenance, and Help menus. On the left side of the screen you will notice a detailed listing of the current customers information as selected from your list of customers located in the customer grid on the right side of the screen. At the bottom left of the screen we have the Customer Information, Call Log, Payment Posting, and the Close/Exit buttons. In the bottom right corner you will find an Active, InActive, Bankruptcy, Repossession, and All Customer List View options to select the type of customer listing displayed in the customer grid. Located at the top of the program are three tabs: Customer List, Call Log, and Payment Posting. Once a Customer is selected, you can click on any of these tabs to move to the respective section of the software. 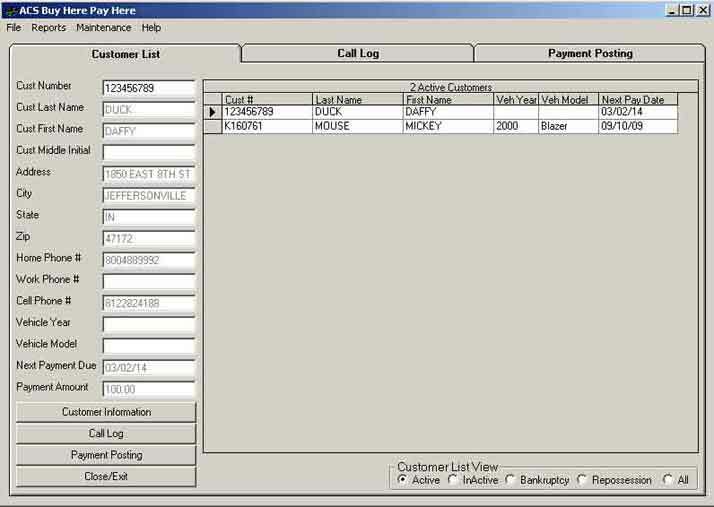 Located at the lower left corner of the program are four buttons: Customer Information, Call Log, Payment Posting, and Exit. These buttons will navigate you to different sections of the software as previously discussed. When you open the software, the program will automatically determine the status of the Customer. As shown above, the Customer Number field color will change accordingly. The following list shows this representation. Shown at the lower right portion of the program is the Customer List View. When choosing Active, Inactive, Bankruptcy, Repossession, or All; the respective Customer list will be shown.